The Irish organisation GLAN today filed a complaint against the Irish/UK oil company San Leon Energy for violating the OECD Guidelines for Multinational Enterprises. The small oil company San Leon Energy, registered on the Alternative Investment Market in London is the only company to have drilled for oil onshore the territory of Western Sahara during the 40 years of occupation by neighbouring Morocco. Today, the National Contact Point in Ireland of the OECD Guidelines for Multinational Enterprises today received a complaint from the Irish organisation GLAN. "San Leon’s activities in Western Sahara contribute to the maintenance of an illegal annexation and to the denial of the internationally-recognised right of the Sahrawi people to self-determination in their territory. Companies like San Leon benefit from Morocco's illicit economy in Western Sahara and contribute to the severity of ongoing human rights violations”, GLAN’s Legal Advisor Dr. Valentina Azarova explained in a press release today. The organisation explains that the complaint is relating to the violation of human rights of the people of Western Sahara. The complaint alleges that the company failed to ensure that it has the consent of the Western Saharan people before drilling for oil on their land. San Leon has headquarters in Dublin. Forbes has already covered the complaint, San Leon failed to respond to Forbes regarding the matter. “They are not a representative people”, a San Leon representative told Irish national TV in 2011. The Norwegian Government pension fund divested from the company due to this matter in 2016. GLAN's complaint is supported by Polisario Front - the international representative of the Sahrawi people - in addition to three civil society organisations from Western Sahara working on the issue of natural resources. Massive numbers of Saharawi refugees gathered last weekend to send a clear message to Irish oil company San Leon Energy which is looking for oil in their occupied homeland: "San Leon: go home". The complaint shows that companies like San Leon who are required to ensure that any business dealings in the Western Sahara occurs with the prior consent of the Sahrawi people, cannot do so while operating in Western Sahara under the aegis and authority of Morocco. The requirement of consent was also applied by the Court of Justice of the EU when considering the extension of EU-Morocco relations to Western Sahara in 2016 and 2018. 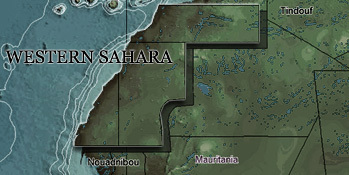 San Leon has, by its own admission, failed to comply with this basic legal requirement and has publicly referred to the territory as Morocco’s ‘Southern Provinces’ (in line with its definition under Morocco’s domestic law). GLAN legal advisor Dr. Ioannis Kalpouzos added, “Ireland’s OECD National Contact Point was created to ensure Irish corporations do not enable violations of fundamental rules of international law. San Leon’s unlawful exploitation of Western Sahara’s natural resources is exactly the sort of case that should activate its use”. The complaint is submitted in the wake of the Irish Senate’s approval of the Economic Activity in Occupied Territories Bill 2018, which aims to prohibit business activities in occupied territories that benefit from and contribute to the unlawful creation and conveyance of property rights and use of natural resources for the benefit of an occupying state’s nationals.